Christmas is nigh! That time of the year when you give your daily, mundane life a short shrift and look to de-stress by taking a trip with your dear ones. Unfortunately, due to high demand, you often find that stepping out for a vacation could cost you an arm and a leg. But fret not. 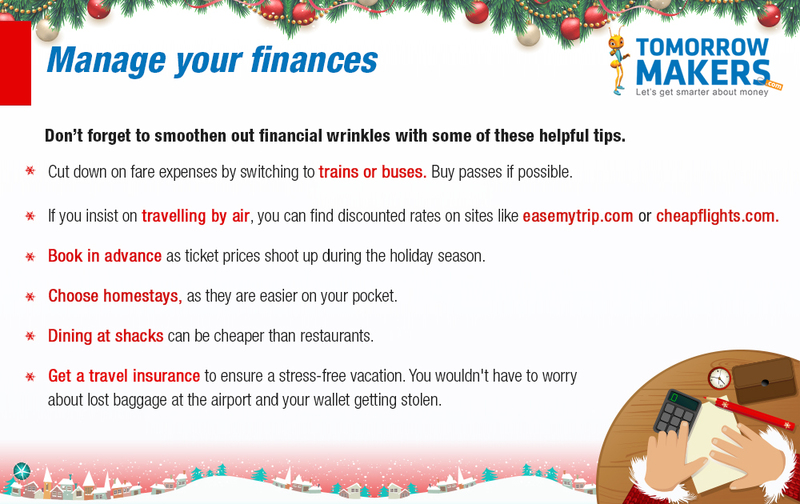 Read on to know how you can manage a Christmas getaway that suits your pocket. You can opt to visit Shillong if you wish to visit the countryside. Nestled in the Himalayas and surrounded by the tranquillity of waterfalls and botanical gardens, this hill station is perfect for nature lovers. But this sleepy, quaint town comes alive during Christmas. The annual Christmas tradition is followed to the tee in this sleepy town. The streets and houses are decked up in lights, while local musicians regale the churchgoers with Christmas carols. If you book a homestay, you can experience the traditional cuisine that locals feast during the festival. The main attraction, however, is the Cathedral church, which is one of the oldest churches in Shillong. Related: Just saving money is not always enough. Here is how to save smart. It is always ideal to book your air tickets in advance. But, if you want to book a ticket at the eleventh hour, you can look for cashback offers on the internet. You can even opt for home-stays over hotels. For food, you can check out their local cuisine. The cafes are reasonably priced and a meal for two will cost you around Rs 400. Off the south-west coast of Thailand, Phuket’s weather at this time of the year is perfect for Christmas revellers. The sun is soft and the beaches are friendly. And so are the hotel tariffs. If you prefer bustling areas, stick to the Patong area. For a quieter Christmas, try Kata in the south of Phuket. Phuket is ideal for family getaways. If you have time to dust off the sand off your back, you can visit temples. The place is known for its pocket-friendly accommodation. To save further, rent a bike to visit local markets and temples. Indulge in their local dishes. Eateries are dotted across the town, especially at the night markets. Hotel buffets are overpriced, so you can skip them and opt for a value breakfast at restaurants on the beach. You can also plan a day trip to the Phi Phi on a ferry (costs only 600 baht), visit the Phang Nga Bay (1,100 baht per person) and Bangla Road for affordable drinks. Get a local SIM as roaming is quite expensive. Prague in east Europe is said to have an incredible energy around Christmas time. Its beauty is unparalleled as Gothic structures dominate the city’s streets. Visit local Christmas markets in the Old Town Square of Prague and feast on fluffy cinnamon rolls or ham. Check out Wenceslas Square, Namesru Miru, the Prague zoo for special Christmas events and the breathtaking Charles Bridge. In this case, book your flight months in advance. If you don’t have time, search for a website that offers tickets at a reasonable rate. Airbnb works out cheaper than hotels in Prague. Also, remember that hotels have 4-for-3 deals that can help you save. Use the public transport and make sure you get a travel pass. It is cheaper that way. Pizzerias are cheaper and the local markets also have affordable food. Edinburgh has a booming art and culture scene among other attractions. Expect fireworks and bagpipes on Christmas day. Enjoy panoramic views of the capital from the top of the Big Wheel, visit Andrew Square for some ice skating and Santa Land in Princes Street Gardens for fun rides and toys for children. Head out for food and drinks at the Scottish Market on George Street and pick up gifts at the European Market in the Mound Precinct. Book flights on websites that offer cheaper alternatives. Consider Airbnb or HomeAway instead of hotels. Try budget-friendly restaurants like Oink, The Piemaker, Mosque Kitchen or bars like The Dogs. Avoid taxis, as they are very expensive in Edinburgh. Make use of low budget tours like The Free Walking Tour. Most museums have free entry. You can also catch free improv shows at The Stand. Sunbathe during Christmas, hire a kayak, watch sea creatures like fur seals and dolphins along the east coast of Kaikoura and revel in the natural beauty of the town. It’s not too crowded during Christmas. This place is for you if you want to take in the small pleasures of life. While booking plane tickets, look for cash-backs, discounts and other offers. If you’re planning to camp around, rent a camper van for the family to save accommodation costs. Take bus rides as they are more affordable and also comfortable. Look for affordable accommodation like home stays, hostels, etc, as hotel prices would be expensive. For deals on almost everything, use bookme.co.nz and save on ticket expenses. The average daily cost per person is approximately Rs 3,200. Home to around 400-odd churches, it makes for the Christmas holiday you always dreamt of. Beautiful Catholic churches lining the seaside, carolers in busy streets and fireworks in the midnight sky make it a visual delight during December. Midnight mass services start at 10 pm at most churches, so make sure you get there early. Related: Is buying travel insurance online a good idea? So, now that you know what where to go, pack your bags, and give yourself and your family a well-deserved Christmas break.